The Cork Folk Festival (3rd - 7th October 2012) offers several free events for children. For further information please visit www.corkfolkfestival.com. Cork Folk Festival, Arts@Civic Trust House, 50 Popes Quay, Cork, Ireland. 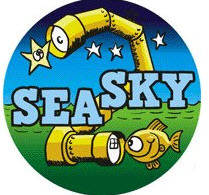 Sea2sky, Explore Your Universe, European Researchers night. Abair le Hilda é má dteastaíonn uaibh ceann a cheannach. Let Hilda know if you would like to buy one. Joseph has been visiting Ireland for many years and has 25 years of experience in senior school management. He also gives worldwide workshops and seminars to teachers and parents about the education of children. There is a 10euro cover charge at the door. Tea and coffee will be availabe on the night. Please note places are limited and anyone wishing to attend should email kilbonanens.ias@eircom.net or call the school directly on 021 733 1730. We are looking for parents to contact the companies they work for to see if they will sign up for the 'Adopt a School' scheme. This is a great opportunity for the school to help with IT training, equipment etc. To ensure we do not contact Companies more than once, can you please forward on the name of the company to pa@gaelscoilchionntsaile.ie and we will remove them from our mailing list. On the 5th of October we will be mailing companies looking for their support so if you can forward on any company names before this date it would be much appreciated. N.B. Eli Lilly have agreed to supply the school with some PC's so please do not contact them. athrú. Mí Feabhra - Ní bheidh 3 lá, beidh 2 lá - 14ú & 15ú. Ní an 13ú. Tá fáilte roimh cailíní agus buachaillí Ranganna 2,3,4 chuig traenáil peile gaelach gach Déardaoin ó 2.30 go dtí 3.30. Leanfaidh sé ar aghaidh ar feadh cúpla mí, ansan tógfaimid briseadh agus tosnóimid arís tar éis an Nollaig am éigin. Tá fáilte roimh páistí de gach chumas. Is iad na leanaí a bheidh ag traenáil na leanaí a bheidh ag imirt ar foireann na scoile ins na comórtaisí. All 2nd, 3rd and 4th class students are once again welcome to join football training after school every Thursday from 2.30 - 3.30. Training will continue for a few months and then take a break until the weather improves. Children of every ability are welcome. Those who come to training will be the ones playing on the football team for the school. Yoga is uplifting, noncompetitive, mind expanding and fun way for children to build strength, concentration and explore various techniques for quieting the mind. It’s that time of year again when a new PA Committee is elected. This year we are looking for new volunteers to come forward and work in a team to help with PA activities. Every year people say “it’s the same people every year doing everything” this year lets break that mould and try to get involved in the PA in any way you can. I understand many have full time jobs, small children etc. However, this is your child’s education and the way the cuts are coming in its becoming more difficult every year to get funding for basic equipment and supplies. You may not for want to become a PA Committee Member. However, this does not mean you cannot participate in PA activates, ways of helping include: Attending events, Volunteering for running events, Signing up for different clubs for example Garden Club / Web administrators - these are all excellent ways of getting involved. I encourage all to get involved. Money was given to bord of management for the New White Board in one of the classes. All of these items could not have been purchased without a strong/dedicated Parent’s Association. A big thank you to everyone for your support and dedication throughout the year. Please come along on Monday Oct 15th 2012 8pm at the Scoil to volunteer / show your support. Remember the PA cannot operate effectively without volunteers. 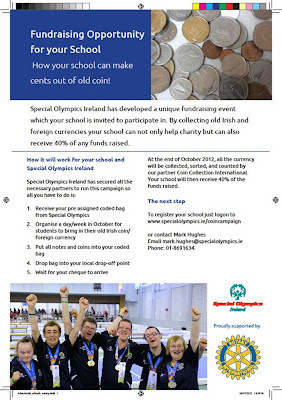 2012 has been a challenging time for fundraising at Special Olympics, as I'm sure it has been in your school. We are delighted to inform you of an innovative way for your school to raise essential funds through a mutually beneficial fundraising initiative with Special Olympics. In conjunction with Coin Collection International (CCI), we have developed a fundraising event called the "Old Currency Collection." We believe that there is a substantial amount of old Irish coins/and or foreign currency in homes across the country. This "Old Currency Collection" will allow Special Olympics to collect these old Irish and foreign currencies, including sterling and euros. We have partnered with Rotary Ireland and Ulster Bank on this initiative. CCI have been engaged to collect money from all Ulster Banks and then to sort and count the currencies. CCI will be charging a commission for this service which is estimated to be approximately 15%. 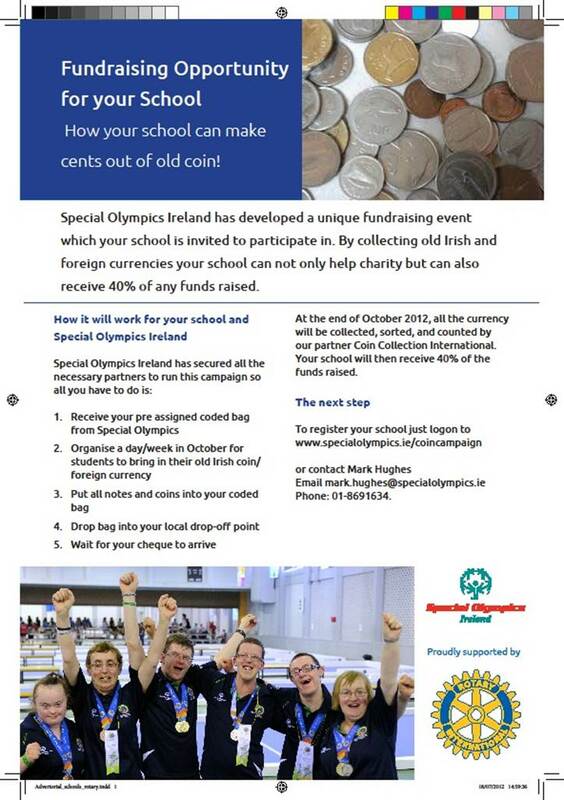 The remaining money will then be split 40% to your club and 60% to Special Olympics Ireland. 1. Register for the campaign by telephoning Siobhan on 021 4977192 or by logging on to our website www.specialolympics.ie/coincampaign. 2. We will provide you with a collection pack containing posters, coin collection bags and bank security bags. You can give these to your pupils, family members and place in local shops etc. to get everyone in your area involved with you. 3. Organise a day or week in October for your group to collect old Irish, foreign, euro and sterling currencies. 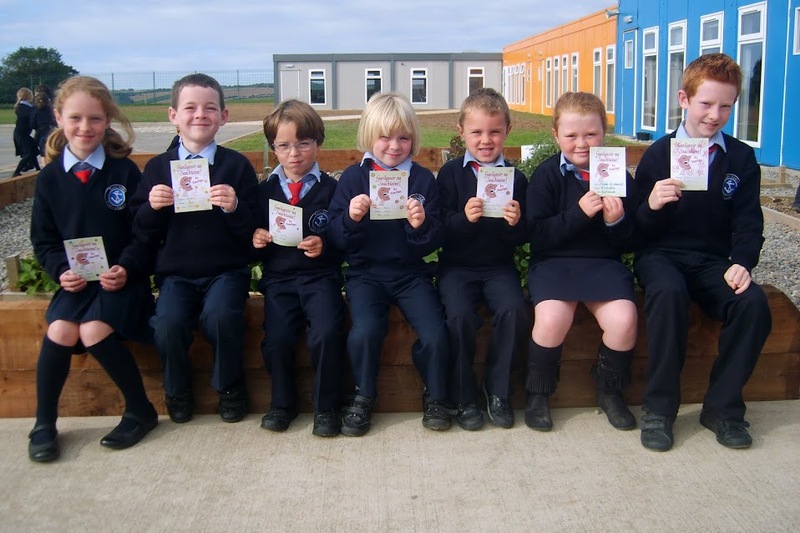 When you have collected all of the money from your school, place all notes and coin into your coded bag (included in pack) and drop your bag of coins into your local Ulster Bank by 31st October 2012. 4. Electronic payment (based on the 40%/60% split) will be made to your bank account by the end of February 2013. We need your help on this project to ensure its success and think that this could have great fundraising potential for schools. We hope that you are interested in participating and look forward to working with those that register to get involved. If you require any more information I will be delighted to answer any questions you may have. Please see poster with information below. Beidh Gaelchultúr ag cur tús lena ranganna Gaeilge oíche do dhaoine fásta an tseachtain seo chugainn (24–29 Meán Fómhair 2012) sna hionaid seo a leanas: Baile Átha Cliath, Ceatharlach, Corcaigh agus Luimneach. Beidh Ranganna Beo ar Líne againn den chéad uair an fómhar seo agus beidh siad ar fáil do dhaoine ar fud an domhain. Tabharfaidh Gaelchultúr mí saor in aisce ar ár suíomh ríomhfhoghlama, ranganna.com, do gach duine a chuirfidh rang oíche in áirithe linn. Chomh maith leis na cúrsaí thuas, beidh an Dianchúrsa Ullmhúcháin i gCruinneas na Gaeilge ag tosú Dé Sathairn, 22 Meán Fómhair, agus cuirfear tús leis an gcéad Chúrsa Gaeilge d'Iarratasóirí Hibernia eile idir 11–13 Deireadh Fómhair. Gaelchultúr's Irish language evening classes for adults will commence next week (24-29 September 2012) in the following venues: Dublin, Carlow, Cork and Limerick. We will also have Live Online Classes available worldwide for the first time. We're offering one month's free subscription to a ranganna.com course to everyone who books a night class with us this autumn. The Intensive Course in Written Irish will begin Saturday, 22 September, and our next Irish Language Course for Hibernia Applicants will start 11–13 October. Tháinigh na leabhair Bookpeople dosna daoine a d'ordaigh iad - tá siad le bhailiú san oifig. Tá seoladh an suíomh idirlín Bookpeople thíos - tá na praghasanna an-mhaith agus is féidir leabhair a ordú uatha. The Bookpeople books came for the people who ordered them - for collection in the office. See below the Bookpeople website address - the prices are very good and they take orders. Tá na ranganna veidhlín (Suzuki) ag tosnú arís ar an gCéadaoin seo chugainn, 19ú, Meán Fómhair 2012. Tá costas €91 ar an téarma seo - ó 19 Meán Fómhair go dtí an 19ú Nollag 2012. 'Sé €7 an cleacht. Má tá suim ag do pháiste leanúint ar aghaidh leis na ranganna, abair é le Hilda san oifig chomh luath is féidir led'thoil. Féach thíos ar an litir eolais ón múinteoir veidhlín, Ciara Ó'Haloran. Tá na páistí nua i Rang 1 in ann páirt a ghlacadh sna ranganna veidhlín anois má tá suim acu. The Suzuki medhod violin lessons are starting again next Wednesday, the 19th September 2012. There is a cost of €91 for this term - from the 19th September to the 19th December 2012. That is €7 a lesson. If your child wishes to continue with the classes, say it to Hilda in the office as soon as possible, please. See the information letter below from the violin teacher, Ciara O' Haloran. The children who have reached1st Class are now able to take part in the violin lessons if they are interested. As you may know, I have been running a group violin programme in the school for the last two years. The programme is based on a modified approach to the Suzuki method combining basic Suzuki principles with aspects of conventional group teaching. This year classes will take place once a week on Wednesdays for 30-40mins in a group setting. Dr Suzuki based his teaching on the 'Mother-Tongue Method', following the pattern of a baby learning to speak its native language. Music learned will include standard Suzuki repertoire as well as other conventional pieces. It is important that parents believe that musical training should be an integral part of their child's education and are prepared to work with their child at home each day, based on the work at the lesson with the teacher. Each student will need the correct size violin, a sponge & elastic band or shoulder rest and a folder with clear pockets for class work. Violins are available in ProMusica in Cork and 20% off vouchers are available towards the purchase of the violin. Violins may also be available to purchase from other students in the school who would be progressing to the next size. The fee is €7 per lesson paid on a term by term basis. The current term will run from September 19th to December 19th which comes to a total of €91. If you would like your child to be considered for a place, please notify Hilda in the Office. I am available on 087-6579256 if you would like to contact her directly with any questions or queries. Beidh dhá lá spóirt againn i mbliana arís. Táimid ró-mhór chun claí le lá amháin. Mar sin tá sé beartaithe againn spórt a dhéanamh ar an Luan agus ar an Déardaoin. Go raibh maith agaibh. We will have 2 sports days again this year. We are too big to stick to one day. So we have decided to have sports on Mondays and Thursdays. Tá an iománaíocht le thosnú amárach (Déardaoin), tá súil againn, ag braith ar an aimsir. Mar sin, tóg camán, clogad agus sciath lorgaí libh ar scoil má tá siad agat. We are hoping to start hurling tomorrow (Thurs), weather permitting, so if you have one, please bring in your hurley, helmet and shin guards. Beidh Rang a 3 ag teacht le chéile le haghaidh ranganna le múinteoir Siobhán Ní Bhruacháin an tseachtain seo chugainn. Beidh na ranganna seo ag leanúint ar aghaidh don bhliain mar a phléadh libh roimh an Samhradh. 3rd Class will be coming together for classes with Múinteoir Siobhán Ní Bhruacháin next week. These classes will be continuing for the year as discussed with you before the Summer. Meabhrúcháin faoi an oíche eolais do thuismitheoirí naíonáin bheaga a bheidh sa scoil tráthnóna amárach ag a sé a chlog. Reminder about the information evening for parents of Junior Infants. It is at the school tomorrow evening at 6 o' clock. A thuistí, Cuireadh ar an eolas mé go bhfuil cás míoltóga ghruaige nachmór i ngach rang sa scoil! Scrúdaigh gruaig do pháiste anocht agus cuir an leigheas cuí air más gá. Tá sé an-dheacair fáilt réidh le míoltóga ghruaige muna bhféachann gach clann ar gruaig a bpáistí féin.Táim ag impí oraibh seo a dhéanamh chun cosc a chur ar an fhadhb go tapaidh. Ní theastaíonn uainn an fhadhb leanúnach céanna mar is a bhí againn an bhliain seo chaite! Dear parents, I have been informed of a case of head lice in nearly every class the school! Please check your child's hair tonight and treat it if necessary. It is very hard to get rid of head lice if each family does not look at their own children's heads. I am imploring you to do this to stop the problem quickly. We don't want the same continual problem as we had last year! We write to you concerning the preparation for your child's First Confession and First Holy Communion. We have invited an outside facilitator, Mícheál de Barra who has a lot of experience in Faith Development. He will help us, parents, teachers, parish community, all together, to look at how best we can help the children prepare for the Sacraments. The meeting will explore what is essentially involved in the preparation and help families to decide if they want to be part of the parish Preparation Programme. Accordingly, we invite you to a meeting of the parents/guardians only in the Friary Centre (next to Friary Church in Catholic Walk, Kinsale) on Monday next, September 17th 2012 at 8pm. This meeting will last two hours approximately. At this meeting, those who wish to participate will be given details of the Preparation Programme and significant dates. May the Lord be with us all to help us to do the best for the children. Ar mhaith leat Gaeilge a fhoghlaim nó a fheabhsú is a chleachtadh? Would you like to learn or improve and practice your Gaeilge? 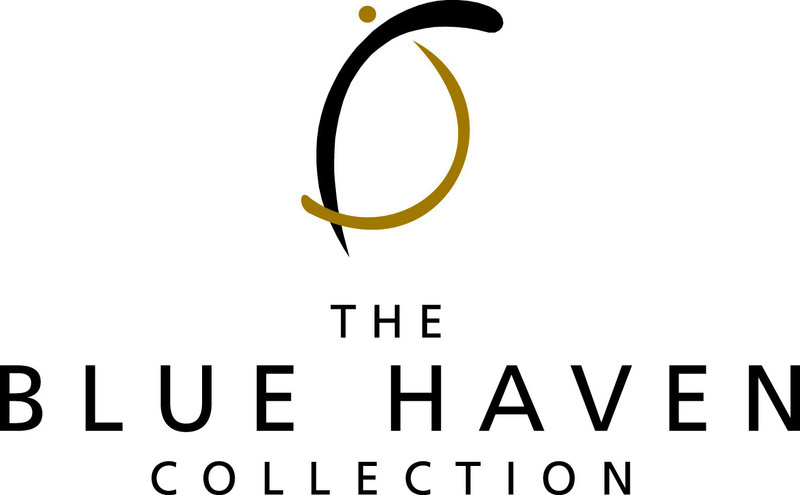 Irish conversational circle meets every Friday evening, 6-7pm in the Blue Haven Bar. It is informal and we just meet for a chat as Gaeilge. There is no charge. Everybody (all levels) is welcome to come along. It's back to school for Le French Club. Our new term starts Friday 28th of September 2012 in our Scoil. As you may already know, there's evidence that children learn languages more easily in the early years because their brains are so feverishly making new neural connections. They can literally hear all the unique sounds of a foreign tongue better than a teenager or an adult. The best way for your child to learn a language now is through conversation with a native speaker, games and songs. Your child is also far more likely to retain the second language if continuously exposed to it as he grows. Some research shows there may be a brain-connection boost, even if your child never becomes fluent. Our aim is to give children a very strong grounding in Language, culture & heritage. Through fascinating, inspiring activities your child will absorb a foreign language in a natural, fun effective way. For more information see attached document. Contact:Maria-0872553810 Joanne -0862573289 or email info@kinsaletennisclub.com stating name, age and the day you are interested in. Please note that groups are limited to 8 and is on a first come basis, so if there is a second choice in date please say so. The After School Club will commence this Monday the 10th of September 2012 for the Senior Infant classes ONLY. Junior Infants can avail of the service once their class moves onto a 1:30pm finish. There’s plenty of information in this month’s edition of Nuachtlitir Ghaelchultúir about events run by the company itself and by other organisations. So whether you’re looking for a language course or an Irish language social event, you’ll find all the best advice here. Beidh oíche eolais roghnach sa scoil an Déardaoin seo chugainn (13ú Mean Fomhair 2012) @ 6.00. Freagróidh me aon cheisteanna ginearálta ata agaibh, go poiblí, i leith lá scoile do pháiste. There's an optional information night for the parents of the new Junior Infants Thurs 13th Sept 2012 @ 6.00. I'll answer any general questions you might have, in an open forum, about your child starting school. Críochnú ar an 27ú Meitheamh - lá amháin níos luaitheFinishing on the 27th June - one day earlier! Family Mass for start of the school year 2012-2013. There will be a Family Mass in St John the Baptist Parish church at 10am next Sunday, Sept. 9th. 2012. We will be praying for the Lord's help and guidance for all the children, teachers, parents and school staff for the year ahead. Sí an Déardaoin an lá atá roghnaithe don spóirt mar sin ba cheart go gcaithfeadh na páistí an éide spóirt a chaitheamh. Táimíd chun ár ndícheall a dhéanamh claoí leis an lá san don spóirt as seo amach, ach gan amhras is féidir go dtiocfaidh athrú ar an scéal. Meabhrúchán faoin gceist snáimh chomh maith. Freagraí istigh roimh an Aoine le bhur dtola. It has been decided that Thursday will be the sports day so the children should wear their sports clothes every Thursday. We are going to do our best to stick to that day for sports from now on, but without doubt, it could change. Also a reminder about who is/isn't swimming this year. Please can you let us know before Friday. The next PA meeting will take place on Monday, 10th September 2012 at 7.30pm at the Scoil. The AGM will take place in October where a new committee will be elected. Please can you fill in and sign these forms as soon as possible.